Yes, whatever the error is on Google's end (and it clearly is that, not a hack, unless it's some kind of inside hack) it's basically reset my account so it's like a brand-new Gmail account. My contacts are intact, but nothing else--the folders have reset to default, my signature line is blank, the "theme" is changed back to the default and--of course--every single email from the last 7 years has vanished completely. The Google Apps Status page mentions that "this issue affects less than 0.08% of the Google Mail userbase" and "Google engineers are working to restore full access". The users that are affected "will be temporarily unable to sign in". This is a really important problem for Google and one of the biggest Gmail issues ever since Google's email service was released, back in 2004. Update: A Google engineer says that the "accounts that are affected are currently fully disabled. We're in the process of changing this to be a Gmail only disable so you should regain access to other Google services soon. This will also mean email to these accounts stops bouncing and gets queued up for later delivery instead." 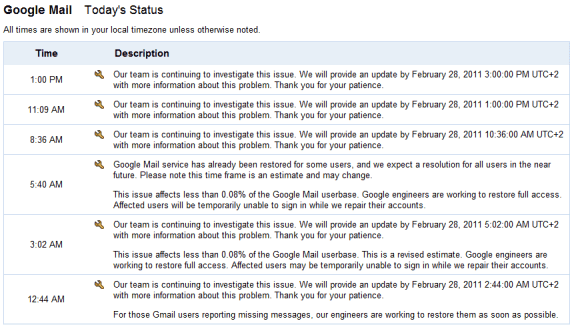 Update 2: Google says that only 0.02% of the Gmail users were affected. "In some rare instances software bugs can affect several copies of the data. That's what happened here. Some copies of mail were deleted, and we've been hard at work over the last 30 hours getting it back for the people affected by this issue. To protect your information from these unusual bugs, we also back it up to tape. Since the tapes are offline, they're protected from such software bugs. But restoring data from them also takes longer than transferring your requests to another data center, which is why it's taken us hours to get the email back instead of milliseconds." Paul Buchheit, the ex-Googler behind Gmail and a former Facebook employee, answered a question about the rivalry between Google and Facebook. There is an interesting competitive element there because Facebook is growing very fast, and obviously, Google would like to compete in the social-networking space. They have finally realized its importance, and they are finding themselves, maybe for the first time, with the realization that there is someone who is way, way ahead of them. 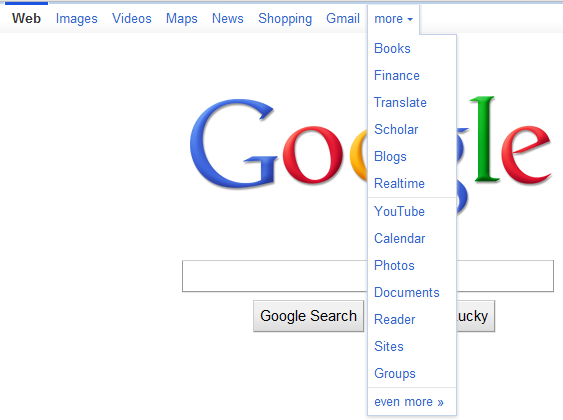 There was a moment with Microsoft that they assumed that Google was like, "Well, yeah, search isn't that important. And if it does become important, we'll just hire some people and we'll take over." They kind of thought it was something they could win really easily, and they underestimated the difficulty of it. I kind of feel like Google may have reached that same moment with social networking, where they realized, A, it's important, and B, it's really hard to win. 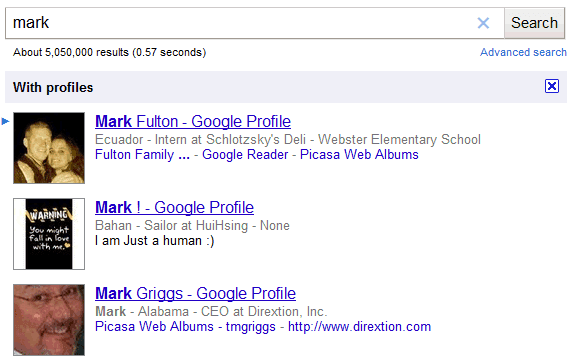 Paul is not the first ex-Googler who thinks that Google didn't understand the importance of social networking. Another former Googler said that "there is some belief at Google that their DNA is not perfectly suited to build social products", while Aaron Iba, who worked on the Orkut team, noticed that "social networking [was viewed] as a frivolous form of entertainment rather than a real utility". 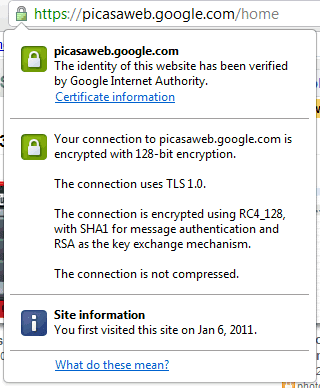 You've probably noticed that Picasa Web's storage counter shows that you have more free space than a couple of days ago. It turns out that this is not a bug. "We recently made a change whereby any pictures 800 pixels and under don't count towards used PWA storage. The new GB numbers you're seeing are the result of quota recalculations that were made," informs a Google employee. The new feature encourages users to upload smaller images. If you use Picasa to upload your photos, there's a setting that lets you pick the dimensions of the photos that are uploaded. The "small" option is recommended "for publishing images on blogs and webpages". Blogger users who resize their photos before uploading them will no longer have to buy extra storage if they're prolific. Another important change is that "all videos under 15 minutes also don't count towards used PWA storage". That means you can now upload short videos to Picasa Web Albums without worrying about the file size. Google Video's homepage shows a strange message below the list of query suggestions: "In accordance with local laws and regulations, some results were removed from this list." The message is displayed for every query you enter, so it's unlikely that some of the suggestions are removed. Update: Google says that "the appearance of the message on every search was in fact a bug and has since been corrected." 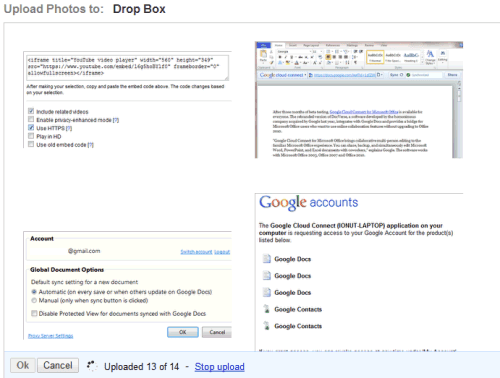 Google Docs lets you pick Image Search results and add them to your documents. That's a good thing, but this feature could have been better thought out. Google restricts the results to images licensed as Creative Commons that can be used commercially and that can also be modified. These restrictions aren't always necessary, since not all documents are used for business purposes. Google also recommends to "only select images that you have confirmed that you have the license to use", but it doesn't link to the pages that included the images. 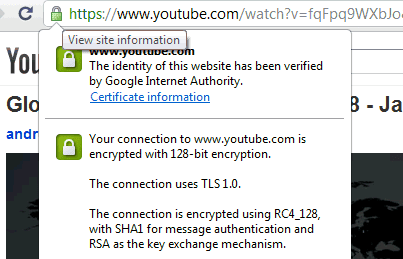 Google doesn't even include a small caption next to the image with links to the Creative Commons license and the original web page. While this feature makes it easy to add image search results to your documents, it doesn't encourage users to visit the web pages that embedded the images or to give credit to the image creators because it's quite difficult to find these pages. 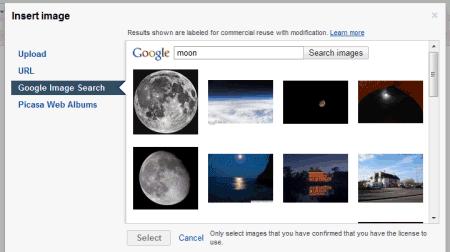 You need to visit Google Image Search, type your query, restrict the results to images "labeled for commercial reuse with modification" and find the image you've previously picked. That's a lot of unnecessary work. 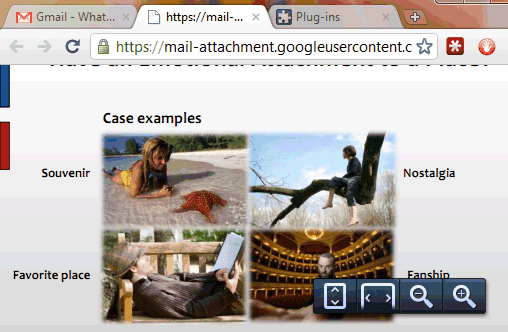 Picasa Web Albums has finally improved the uploading feature. You can now select multiple images from a folder and upload all of them. After uploading images, you can add captions and delete the images you don't like. It's a long overdue improvement that's especially important if you don't use Picasa. Another change is that you can now upload videos without installing Picasa. 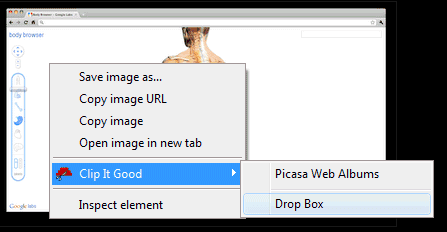 Picasa Web's new uploader uses HTML5 APIs, so it's not available in Internet Explorer, where you still have to install an ActiveX control. Google Chrome does't show a warning when you close a window with multiple tabs. If you accidentally close Chrome windows, you can install Chrome Toolbox. The next time you close many tabs, you'll at least get a warning. Google Chrome's history page is pretty basic and you can't restrict the list to a certain time interval. 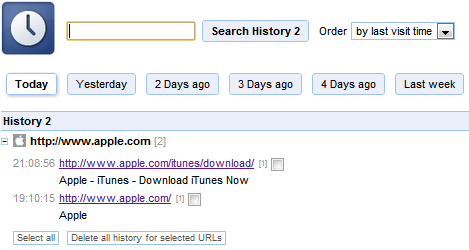 The History 2 extension comes to the rescue by allowing you to sort web pages based on the day/week you visited them. History 2 allows you to delete multiple items from your history page at the click of a button – something that's not possible by default. There's no way to quickly examine an image when you're in Chrome. Fortunately, you can install Image Properties Context Menu, an extension that lets you right-click on an image and find information about the image size, location, dimensions and more. Chrome simply doesn't recognize RSS feeds and all you get is a page with gibberish text. If you install the RSS Subscription extension developed by Google, you can quickly subscribe to any feed using Google Reader, iGoogle, Bloglines or My Yahoo. While other popular browsers allow you to quickly send any web page you're viewing by email, such an option is nowhere to be found in Google Chrome. Closing Google Chrome and reopening it does not restore previously opened tabs. 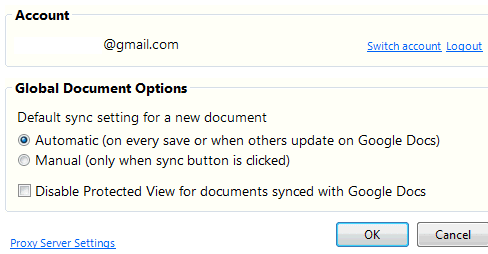 In order to do that, go to the Options dialog and enable Reopen tabs that were open last. If you want advanced session saving options like the ability to create multiple sessions, try the Session Buddy addon for Google Chrome. Firefox 4 lets you switch to any open tab by typing relevant words into the address bar. 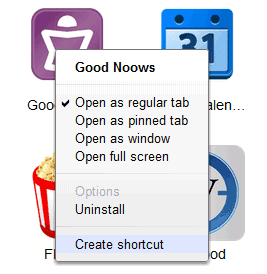 If you'd like to see a similar feature in Chrome, install the Switch To Tab extension. The next time you have too many open tabs, just type sw <TAB> followed by some words from the page. Hitting Enter switches to the tab that's listed as the first match. Have you ever wanted to switch from Chrome to another browser because of a missing feature? Did you mange to find a workaround or an extension that adds the missing feature? Shankar is a blogger and an engineering student from India who writes tech tips at KillerTechTips.com. His latest articles helped users block Facebook and improve productivity in Google Chrome. This post was inspired by an article written by Amit Agarwal. 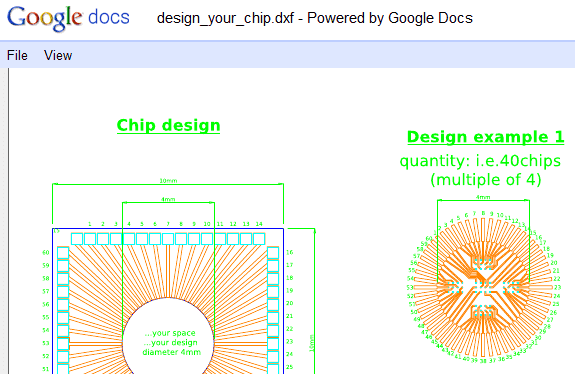 Google Docs Viewer added support for a lot of new file formats. You can now use it to open Microsoft Excel spreadsheets, Microsoft PowerPoint presentations from Office 2007 and Office 2010, Apple Pages files, PostScript documents, Microsoft XPS documents, TrueType fonts, graphics from Adobe Illustrator, Adobe Photoshop, Autodesk AutoCad and SVG files. 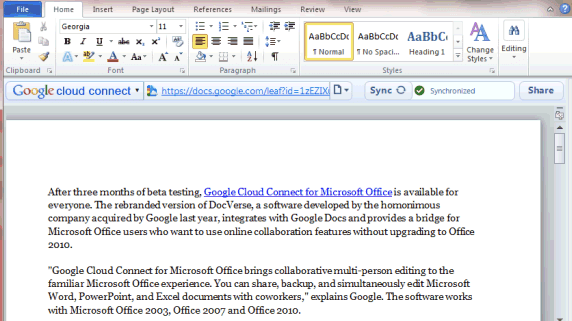 "Not only does this round out support for the major Microsoft Office file types (we now support DOC, DOCX, PPT, PPTX, XLS and XLSX), but it also adds quick viewing capabilities for many of the most popular and highly-requested document and image types," informs Google. Google Docs Viewer is integrated with Gmail and Google Docs, so you can now open many Gmail attachments and Google Docs files without installing additional software. 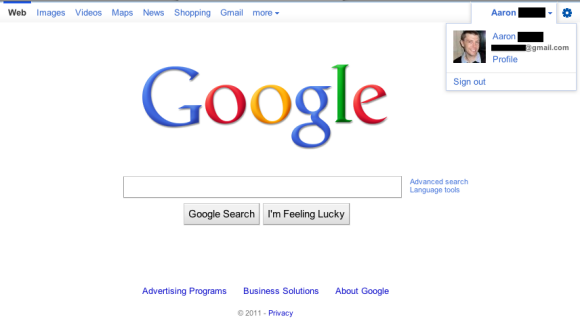 Google Social Search is not a new feature, but it wasn't that important until now. Google used to display at the bottom of the search results page a few links to pages created or recommended by your friends and social connections. The feature automatically obtained data from Google Reader, Google Buzz, Gmail Contacts, Twitter and other sites linked from your Google profile. 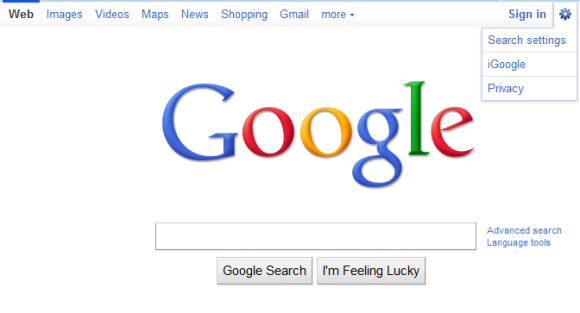 Google's blog announced that Social Search will be used to enhance Google results and will become a ranking signal. Social Search borrowed Hotpot's interface that annotates results with messages like "Dan rated this place 5 stars", so you can see why a page ranks so high. "Social search results will now be mixed throughout your results based on their relevance (in the past they only appeared at the bottom). This means you'll start seeing more from people like co-workers and friends, with annotations below the results they've shared or created. So if you're thinking about climbing Mt. Kilimanjaro and your colleague Matt has written a blog post about his own experience, then we'll bump up that post with a note and a picture," explains Google. Sometimes a web page is more valuable if it has been recommended by a friend because you probably trust that person. Google uses data from your Google account or publicly available data to generate a list of social connections, but you can't highlight the people you trust or customize the list. What you can do is to add links to your Google profile and to import data that's not publicly available. The Google Accounts page will include an option that lets connect your accounts from services like LinkedIn and import your contacts. Google's Daniel M. Russell has more information about the reading level filter, a feature recently added to the advanced search page. The reading-level is based primarily on statistical models we built with the help of teachers. We paid teachers to classify pages for different reading levels, and then took their classifications to build a model of the intrinsic complexity of the text. (...) We also used data from Google Scholar, since most of the articles in Scholar are considered advanced. So the breakdown isn't grade- or age-specific, but reflects the judgments of teachers as to overall level of difficulty. Roughly speaking, "Basic" is elementary level texts, while "Intermediate" is anything above that level up to technical and scholarly articles, a la the articles you'd find in Scholar. That's not exact, but it's a fairly robust model that works across a wide variety of different text styles and web pages. Unfortunately, the feature only works for English and it's probably difficult to add support for other languages. When Google Instant was launched, many power users noticed that they need to press Enter after typing a query that included advanced search operators like site: and filetype:. Most likely, these queries are resource intensive and it's difficult to return the results very fast. Now you can use these operators without having to press Enter or click the search button. 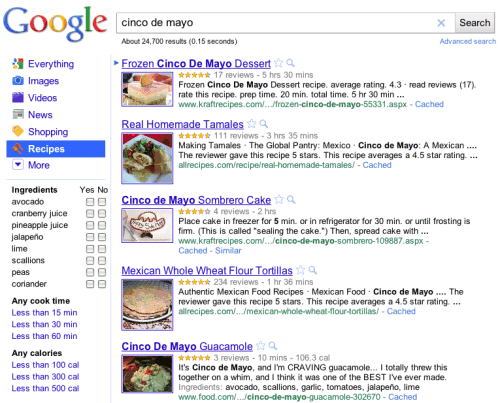 The main advantage is that you can adjust your query and see the results as you type. 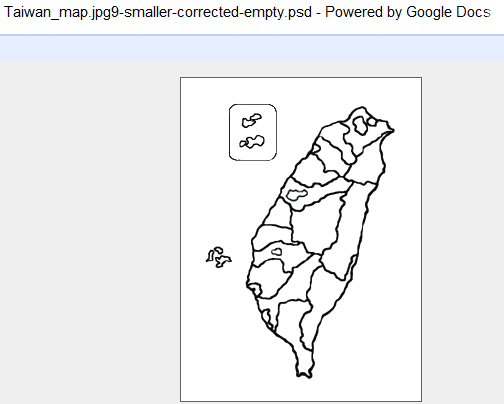 Unfortunately, the results aren't displayed instantly. Google's doodles are now a playground for creating small web apps. Static images are just the starting point for interactive apps that automatically load when you visit Google's homepage. Pac-Man, Isaac Newton, John Lennon and the particles doodle are some of the interactive doodles that surprised many Google users. Yesterday's doodle celebrated Jules Verne's birthday and managed to use some clever animations without being annoying. "[The] doodle, celebrating Verne's 183rd birthday, tries to capture that sense of adventure and exploration. Using CSS3 (and with help from our resident tech wizards Marcin Wichary and Kris Hom), the doodle enables anyone to navigate the Nautilus (nearly) 20,000 leagues with the simple pull of a lever. And for those using devices with built-in accelerometers and the latest versions of Google Chrome or Firefox, it's even simpler — just tilt your device in the direction you want to explore and the Nautilus will follow," explained Google. If you missed the doodle, you can now see a bigger version of the mini-app. It's a good opportunity to check if you have a fast browser and to use the "zoom out" feature of your browser. 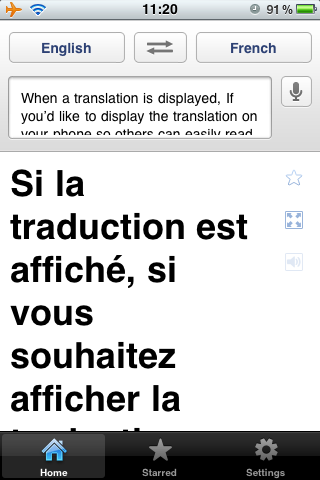 Yet another Google app initially developed for Android makes its way onto the Apple App Store: Google Translate. It doesn't have all the features of the Android app: there's no conversation mode, no SMS translation, Google Suggest or a list of related phrases. Another issue is that the font size is way too big. The application has a feature that's not available in the Android app: full-screen mode, so it doesn't make sense to use a such a big font size which is not even configurable. Google says that "the ability to easily enlarge the translated text to full-screen size" makes it "much easier to read the text on the screen, or show the translation to the person you are communicating with. Just tap on the zoom icon to quickly zoom in." Why would you use the native application instead of visiting translate.google.com? The native application supports voice input for 15 languages, text-to-speech for 23 languages and it's better suited for quickly switching between multiple languages. 1. WebGL is now enabled by default in Google Chrome and you can try the 3D web apps from Google's gallery. 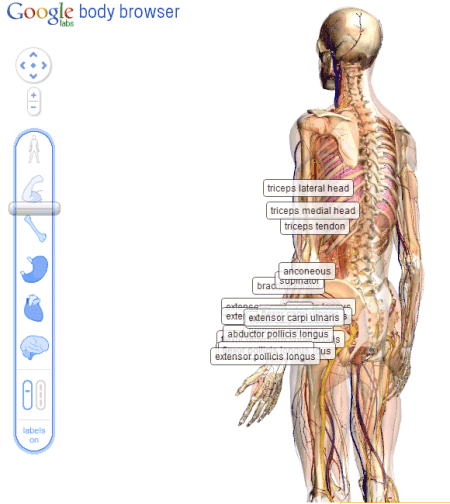 Don't miss Body Browser, a Google Earth for the human body, and the WebGL Aquarium. 2. Google Instant is now integrated with Chrome's address bar, but this feature is not for everyone because it automatically loads web pages as you type. It's disabled by default, so you need to enable it by checking "Enable Instant for faster searching and browsing" in the Options dialog. 3. 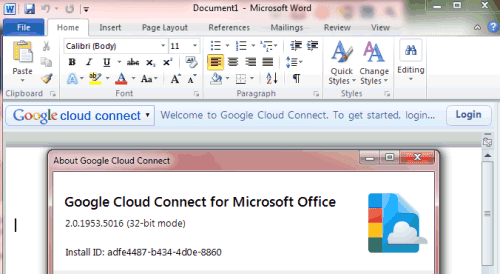 Cloud Print can be enabled from Options > Under the hood if you use Windows. This features lets you print from devices that can't communicate directly with printers. 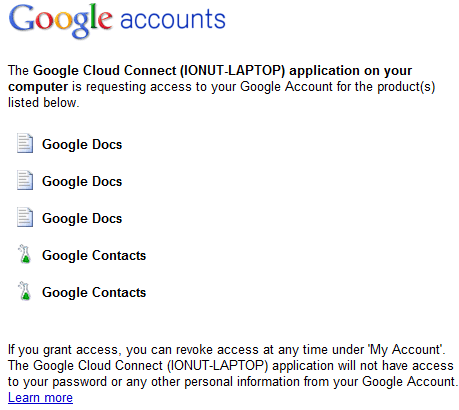 The first two applications that use Cloud Print are the mobile versions of Gmail and Google Docs. 4. Chrome supports WebP files. WebP is a new image format created by Google whose main advantage is that it offers better compression. "Our team focused on improving compression of the lossy images, which constitute the larger percentage of images on the web today. To improve on the compression that JPEG provides, we used an image compressor based on the VP8 codec that Google open-sourced in May 2010." Here's an example of WebP image. 5. Right-click on an extension button next to the address bar and select "Hide button". When you change your mind, go to Tools > Extensions and click on "Show button" next to the corresponding extension. 6. Create desktop shortcuts for your web apps: right-click on an app in the new tab page and select "create shortcut". You can also add shortcuts to the Start Menu and the Quick Launch Bar if you use Windows. 7. Launch web apps in a new window. Right-click on a web app and select "open as window". 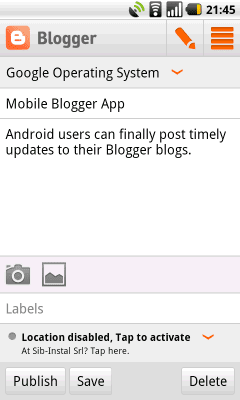 Blogger is catching up with the times: Android users can finally post timely updates to their blogs using a native app. You can always use Blogger's site or even write your posts in a mail client, but a mobile app is more user friendly. Blogger's Android app is really basic and doesn't offer too many features. It's mostly useful if you want to write a new post, since you can't edit the existing posts. The editor only lets you enter text and include one or more photos. You can add some labels and geotag your posts, taking advantage of your phone's GPS. If you haven't finished a post, you can always save it as a draft, but you won't be able to publish it from a computer because it's only saved locally. Blogger's blog mentions that Blogger is a new sharing option, so you can easily share a photo from the Gallery or a web page. "By switching to the List View, you can view all your drafts and published posts that you wrote using the app." Unfortunately, you can't edit existing posts. All in all, Blogger's Android app offers very few features and I would only use it to write short posts or to share photos from a trip. Maybe Blogger's team should also develop a mobile web app which could be updated faster. Android Market link: Blogger's app. 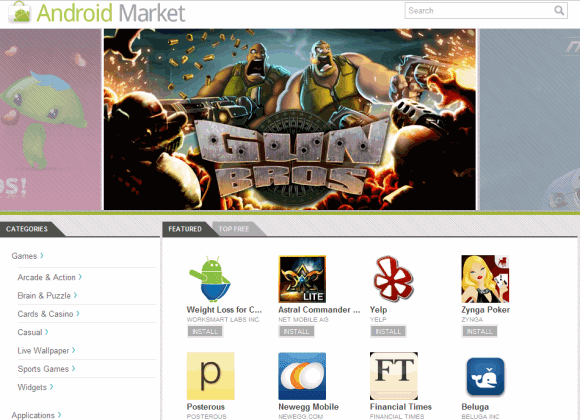 Google has finally released the Web-based version of the Android Market, which is now available at market.android.com. You can link to applications, find apps from your computer and install them over the air. Android Market for the Web includes all the applications, not just the ones that are available for a certain device or a certain version of Android, so it's much more comprehensive than the application that's installed on your Android device. You'll be able to find paid apps even if you live in a country where you can only install free apps and you'll be able to find apps that require Froyo even if your phone still uses Android Donut. 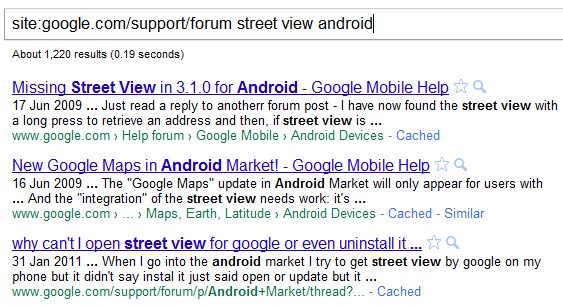 In fact, you don't even have to be an Android user to explore the Market. I've tried to install an application from the web site, but Google shows an "invalid request" error after the authentication process. To make the Market even better, Google announced two additional features that will be available soon: in-app purchases and fixed pricing for various currencies. 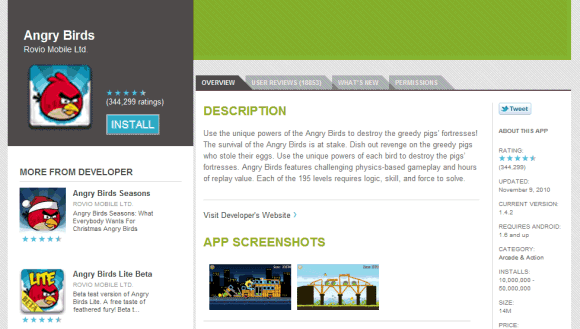 That means you'll see less apps that cost $1.73 or €2.26, assuming that developers will adjust their prices. More and more Google applications that used to be available only for Android are now ported to the iPhone. 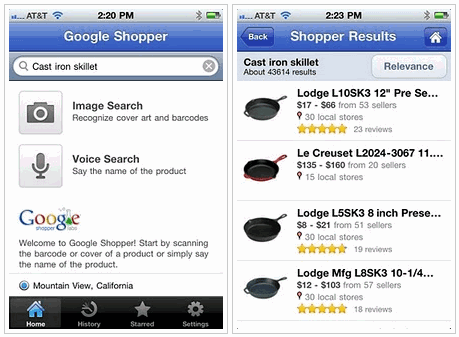 After Google Voice, Google Latitude, Google Places, Google Goggles (a feature of the Google Mobile App), iPhone users can now download Google Shopper, a product search tool that recognizes barcodes, supports voice search and lets you compare prices at online stores and local stores. It's actually a mobile version of Google Product Search that knows your location and has more input methods. Google Shopper saves your history and lets you star products, but it doesn't integrate with Google accounts, so your data is only available on a single device. Another issue is that voice search times out too fast, so it's quite difficult too use. According to Google, "Shopper is available for iPhone 3GS and iPhone 4 with iOS 4.0+ in English only for the United States and the UK." There are still many Android-only apps (Sky Map, Google Translate, Gmail, Google Talk, Google Reader, Google Maps Navigation, Google Finance, Gesture Search) and it's likely that some of them will be available in Apple's App Store in the coming months. 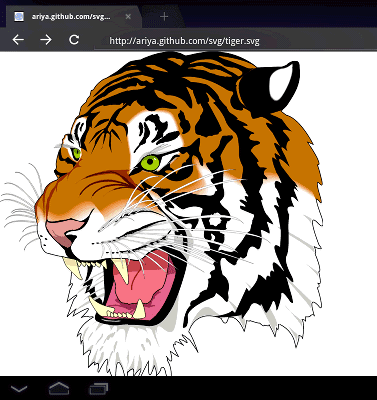 One of the most annoying things about Android's built-in browser was the lack of support for SVG (Scalable Vector Graphics). Android's browser was the most popular mobile browser that didn't support SVG and that was surprising, considering Google's push for better web apps. Ariya Hidayat tried to see if Honeycomb's browser can handle SVG files and the good news is that the answer is affirmative. 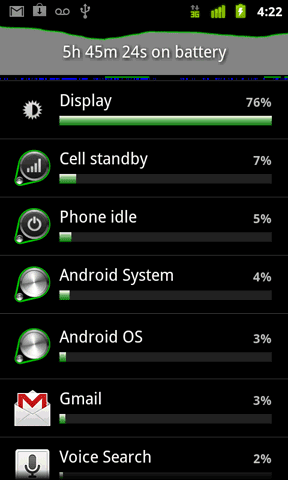 Hopefully, the next Android release for smartphones will include this feature. 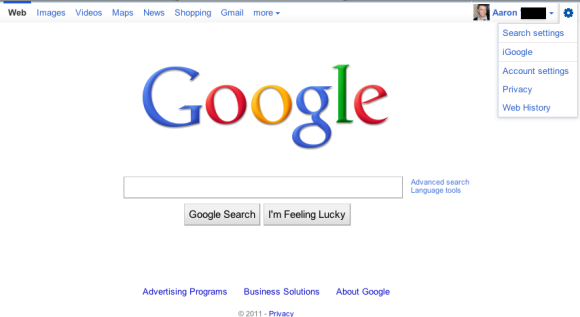 Danny Sullivan has a story about Google's claims that Bing copies Google search results. Google noticed that there's an increasing overlap between the top results at Google and Bing, so it suspected that Microsoft was using Google's results to improve its search engine. To verify its suspicions, Google set up a sting operation. For the first time in its history, Google crafted one-time code that would allow it to manually rank a page for a certain term (code that will soon be removed, as described further below). It then created about 100 of what it calls "synthetic" searches, queries that few people, if anyone, would ever enter into Google. These searches returned no matches on Google or Bing — or a tiny number of poor quality matches, in a few cases — before the experiment went live. With the code enabled, Google placed a honeypot page to show up at the top of each synthetic search. The only reason these pages appeared on Google was because Google forced them to be there. 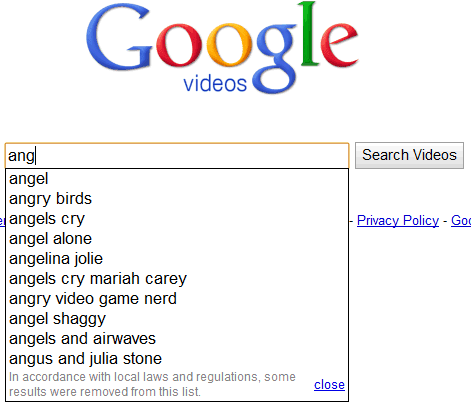 There was nothing that made them naturally relevant for these searches. If they started to appeared at Bing after Google, that would mean that Bing took Google's bait and copied its results. This all happened in December. When the experiment was ready, about 20 Google engineers were told to run the test queries from laptops at home, using Internet Explorer, with Suggested Sites and the Bing Toolbar both enabled. They were also told to click on the top results. They started on December 17. 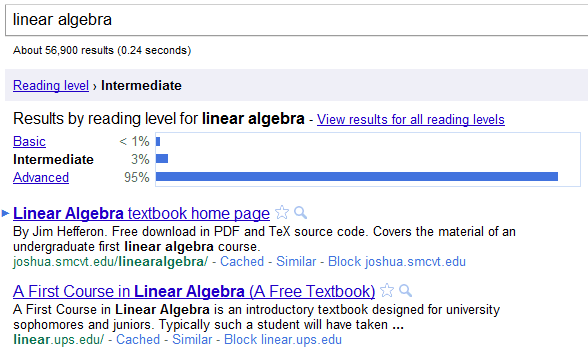 By December 31, some of the results started appearing on Bing. (...) Only a small number of the test searches produced this result, about 7 to 9 (depending on when exactly Google checked) out of the 100. Microsoft's engineers probably thought that Google's results were pretty good, so why not use clickstream data from Internet Explorer and Bing Toolbar to monitor the results picked by Google users? It's a clever idea, but not when you're using it to artificially add results from Google. Bing's team says that they use "collective intelligence" to improve search results, so we can assume that a non-negligible amount of intelligence comes from Google. When you're including results just because Google does it, you're trusting Google too much and you implicitly admit that Google offers better results. Update: Google's Amit Singhal says that "some Bing results increasingly look like an incomplete, stale version of Google results – a cheap imitation" and implies that Bing shows "recycled search results". I think that's an exaggeration and Microsoft has every right to use all the information it has, including analytics data, Bing Toolbar's clickstream, Facebook's popular pages and Twitter's trending topics. Bad mouthing competitors doesn't help Google in the long run. 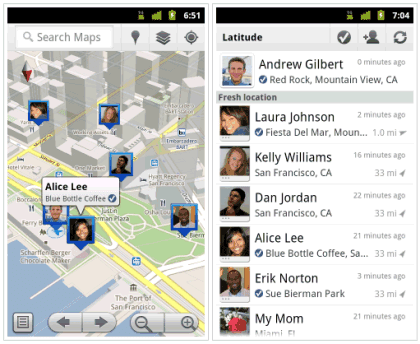 Google Latitude is useful if you want to share your location with a group of friends, but not everyone wants to do that. As Foursquare's success showed, people want to manually "check in" and only share some of the places they visit. To make Google Latitude more useful and to better integrate it with other social services, Google added support for check-ins. "You can still use Latitude to automatically update and share your location, but check-ins let you add context to the location — like captions to a photo," explains Google. It's an opportunity to improve Google Maps by sharing your favorite places, which could also make social recommendations better. Check-ins connect locations to places and they're better suited for sharing because there's no real-time tracking involved. Google says that check-ins will be added to your Google Buzz stream and you can share them with your friends, make them public or private. There are some additional features that help you use check-ins: notifications to check in at a nearby place once you arrive, automatic check-ins at specific places, the option to check out and status level (visitor/Regular/VIP/Guru). Google Places pages include information about your check-ins, your friends' check-ins and your status. Check-ins are supposed to work if you use the latest version of Google Maps for Android. If you use an iPhone, you should see a new version of the Latitude app in the near future. I've installed Google Maps 5.1 for Android, but I couldn't find the new features. Google says that there are 10 million active Latitude users. Check-ins could attract new users and make Google's social services more popular. Ironically, check-ins were made popular by Foursquare, a startup created by Dodgeball's founder and former Google employee Dennis Crowley. Dennis quit Google two years after Google acquired Dodgeball. "The whole experience was incredibly frustrating for us - especially as we couldn't convince them that dodgeball was worth engineering resources, leaving us to watch as other startups got to innovate in the mobile + social space."